What is Computer Science? What is it not? Where do we see it both in Maine and in our everyday lives? What is the skill set our students need to be successful in an evolving workforce that is coming to rely more and more on Computer Science? How can we foster more partnerships, collaboration, and access to resources between educators, non-profits and businesses? What resources exist to help educators integrate computer science into their teaching and learning practice? Computer Science Day, held on August 13th at the State House in Augusta, sought to answer these questions and get kids more interested in the uses of computer science and in the potential careers it can lead to. The day had activities for students, parents and educators with opportunities for kids to learn coding as well as multiple panels and hands-on learning experiences. “It’s really important for students to get into science, computer science, and STEM in general at an early age, because a lot of times once kids are in middle school, they haven’t been exposed to or inspired by really cool science and computer science, often times they are not going to get into it in high school or in college,” says Stefany Burrell, a STEM Education Specialist with MMSA. 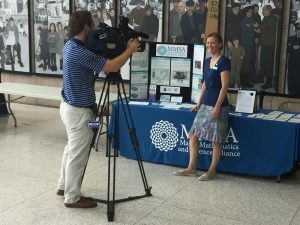 MMSA was excited to co-host Computer Science Day. Through the Exploring Computer Science Program MMSA strives to incorporate computer science into its existing offerings with trainings to over 60 K-12 educators, from Madawaska to Kittery, Eastport to Rumford and throughout the rest of the state. MMSA also offers trainings to anyone interested in hosting a family code night. In addition, we are very proud to partner with project login to offer code.org trainings to Maine educators. There are several opportunities for all types of educators to engage and embed computer science in their work and we are excited to be part of this growth throughout the state. This focus on Computer Science has been a very important component of the work at MMSA but it needs to go beyond coding. We need to find the ways that computer science is embedded in Maine’s communities, its current jobs, and emerging workforce needs. Students need hands-on opportunities to apply computer science to address questions they are interested in.